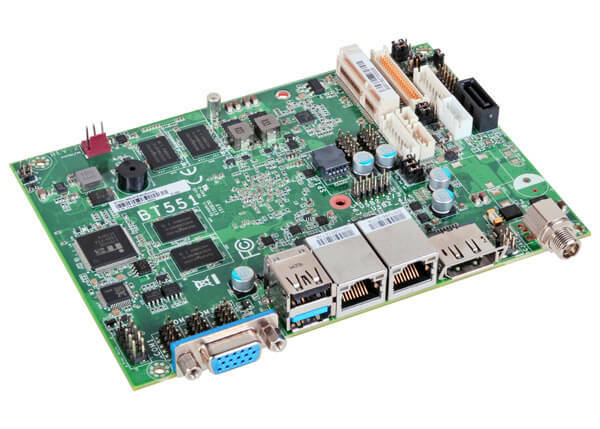 BT551 is a small-footprint, low-power PC board based on Intel’s Bay Trail series processors, including Atom E3845, E3826 and Celeron J1900. With 2 or 4GB DDR3L RAM onboard, as well as a 16GB eMMC (other sizes available), BT551 features support for up to 3 displays via LVDS, DisplayPort and VGA, a miniPCIe socket, USB 3.0 and SATA 2.0. We also offer a slightly larger Bay Trail board, which provides 3 miniPCIe ports. As well as Windows 7 and 8, the BT551 supports Windows Embedded Standard 7 and 8 / 8.1 Standard. Our Windows Embedded specialists can help you to create custom images to take advantage of the embedded enabling features of WES, allowing you to create a locked-down, reliable, non-windows-branded, small footprint image. If you have questions, including pricing and availability, please don’t hesitate to contact us by calling Direct Insight on +44 1295 768800 9am to 5.30pm UK time, emailing info at directinsight.co.uk, or by using the forms to the right.